Five UCs are among the top 10 public universities for undergraduate education in the country, according to the 2019 U.S. News & World Report Best Colleges rankings released today (Sept. 10), and all nine UC undergrad campuses rank among the top 75. UCLA and UC Berkeley were named the top two public universities in the country, with UC Santa Barbara ranked fifth. UC Irvine was No. 7, UC Davis No. 10 and UC San Diego took the 12th spot this year. UC Santa Cruz (No. 26), UC Riverside (No. 35) and UC Merced (No. 67) rounded out the public university rankings. 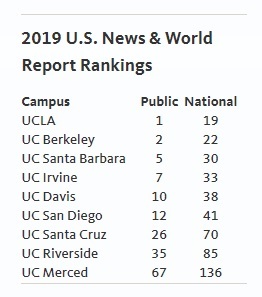 The UC campuses also performed strongly in the overall national rankings, which include both private and public institutions. Six UCs ranked among the top 50 nationally: UCLA (No. 19), UC Berkeley (No. 22), UC Santa Barbara (No. 30), UC Irvine (No. 33), UC Davis (No. 38) and UC San Diego (No. 41). The U.S. News & World Report Best Colleges rankings are issued each fall. They emphasize academic reputation, financial resources and selectivity in admissions. This year, the rankings were changed to reflect graduation rates among Pell Grant recipients, while acceptance rates were dropped. Editors said the change was made to better measure how well colleges do in promoting social mobility. As a result, several UC campuses saw a significant rise in their rankings. UC Riverside showed the most improvement of any national university, moving from No. 124 last year to No. 85, a total of 39 spots. UC Merced was the fifth-most improved, rising from No. 165 nationally last year to No. 136, a journey of 29 spots. In just its 14th academic year, UC Merced is already earning a national reputation for research excellence and academic distinction, while remaining one of the nation’s top-performing universities for student success and social mobility, said UC Merced Chancellor Dorothy Leland. 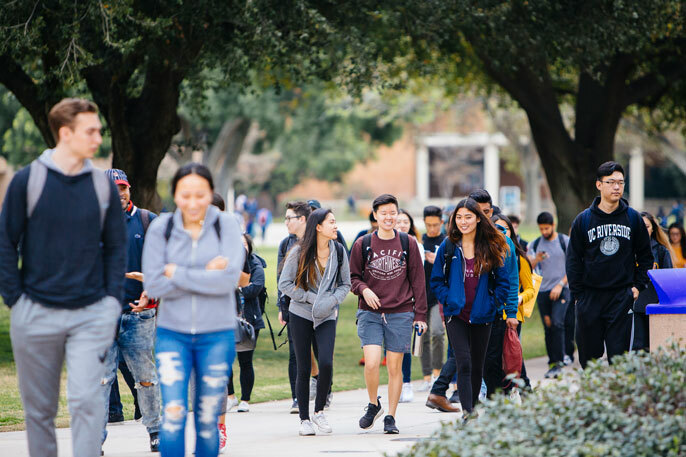 The newly released ranking is only the latest survey to highlight the UC system’s excellence in both academics and social mobility. All nine UC undergraduate campuses were recently recognized by Washington Monthly as colleges that do the most for the country; while five UCs were among Money magazine’s top 11 in its 2018 50 Best Colleges ranking.